Build life skills in an engaging and hands on way! These interactive and adapted books are perfect for building receptive and expressive language as well as attending skills. Interactive books require the student(s) to move the pictures and participate. This active participation improves attending skills while reducing off task time. These books are adapted for special education and speech. They will help students develop matching skills, build language (receptive and expressive) and attending skills. These books have repetitive and predictable text for early readers. *The book, "How To Cross The Road Safely" focuses on the steps for crossing the road. Students match and label pictures. 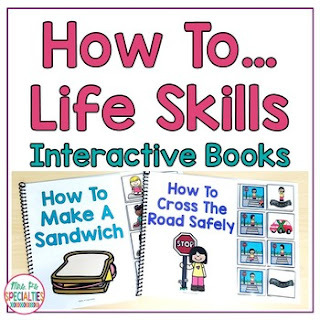 *The book, "How To Make A Sandwich" focuses on the steps for putting a sandwich together independently. Students label and match pictures. Want to get free credits for your next purchase? Every time you purchase something from TPT you are eligible to get free credit on future purchases. To go to your purchases page, hover over the “My TPT” button and click on “My Purchases.” You will see a list of all of the items you have purchased on TPT. Under each listing there is a button that says “provide feedback.” You get one TPT credit for every dollar you spend on TPT. You only get the credits if you leave a fair rating and comment on items that you have purchased. I greatly value and appreciate your feedback!